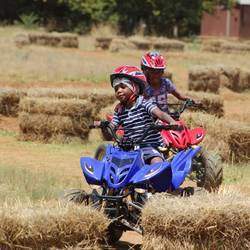 We offer a variety of adventure activities for all ages and occasions. 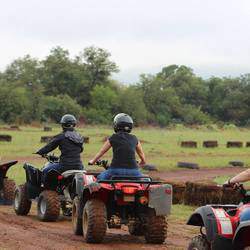 With 10 horses, 4 quad bikes and 4 Go-Karts we are sure to please each and every client. Nestled in the Hekpoort Valley in the foothills of the magnificent Magaliesburg Mountains. 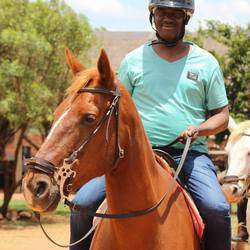 We offer horseback riding with a difference, riding western style on “well trained, obedient, calm and friendly” trail horses, with various rides in to the bush veld and mountain foothills. All the rides are accompanied by trained trail guides and a trained staff member. We have horses suitable for everyone, If you are a total beginner or an experienced rider. Western style riding is becoming more popular and Saddle Creek Ranch is a safe place where you can learn to ride like a real cowboy and have loads of fun. For the beginner the emphasis is on a safe, relaxed and enjoyable ride on horses that will not “run away” with you. The experienced rider can choose a more “spirited horse” for a lively, exhilarating ride. We are aware of clients past bad experiences with horses that are difficult to control and for that reason we are careful to “match” rider and horse, taking into account their past riding experience. Before leaving all the inexperienced riders will have the basic horse commands explained to them. Trained trail guides and trained staff members will be close to them throughout the ride.